In addition to this blog, we're now writing restaurant reviews for Current! We'll be posting extra photos from our expeditions here. Enjoy the photos, then stop over at eCurrent to read our review of Marnee Thai to learn what we thought of these dishes and others. Larb Tod — Minced chicken with ground toasted rice, mint leaves, shallots, and green onion in a Thai northeastern-style dressing. Marnee Thai interior above; and below, the dipping sauces for our appetizers (in extended post). Lately I've been working long hours, and while some nights I'll still spend two hours or so putting together a multi-course meal (because I can't help myself), lately I've been trending toward fast and easy. At Asian grocery stores you'll find shelves and shelves of pre-made pastes and sauces that make throwing together a tasty stir-fry a snap. 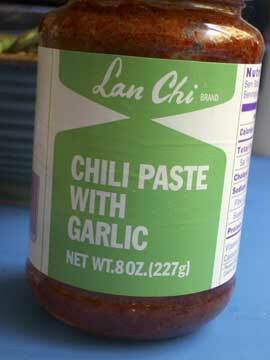 One of our favorites is Lan Chi Chili Paste with Garlic. I substitute Lan Chi whenever a recipe calls for making a pounded paste of chilies and garlic. Scooping out a tablespoon or so is much easier than pounding a paste in a mortar -- and I've done both. I had a big pile of string beans to use up (thanks, Tantré Farms) and fresh basil from my garden, and I couldn't think of anything tastier than pork and string beans. 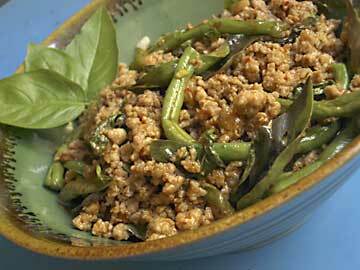 This is a home-grown version based on a Thai pork and basil recipe. This is a fast recipe that's light on the prep -- trimming the beans is the biggest prep tasks. Throw some rice in a rice cooker, and you're all set with a one-course meal. Amounts are approximate. Adjust to your taste. Heat wok over high heat and add a Tbs of oil and swirl to coat. Stir-fry the beans for, say, 45 second or so. Add a good sprinkle of kosher salt over the beans and continue stir-frying until beans start to "pop" and small brown spots start appearing on them. Remove beans from wok and set aside. Wipe wok, reheat, and add a Tbs or so of fresh oil. Add garlic and Lan Chi chili paste and stir-fry for 30 seconds. Add pork and continue stir-frying until pork is cooked. Add in fish sauce, oyster sauce, and sugar and stir until mixed. (If pork is too dry, you may add a bit of chicken stock or water.) Add beans. Taste. Sometimes it needs a bit more Lan Chi or oyster sauce, sometimes its a bit more sugar. Adjust to your liking. Add basil leaves and mix in. Serve with rice. Serves 3 to 4, depending on appetites. Or 2 with leftovers for lunch the next day. Wow! I made this one almost too hot for Joe. That's an accomplishment. This dish is a snap if you have pre-made curry pastes and some coconut milk. I served it with brown rice. 1 lb chicken, sliced for stir-fry. 1 - 3 Tbs green curry paste, depending on how hot you like it. 1/4 C. chopped jalapenos or thai chilies. Again, adjust for heat preferences. Heat a few tablespoons of vegetable oil in a wok. Stir-fry the curry for a minute. Add meat. Stir-fry for a few minutes. Add vegetables and coconut milk and sugar, and cook for a few more minute. Stir in basil and coconut cream. Serve with rice. I've been taking my own sweet time with our Canadian Weekend, but the end is near. We met up with some friends who live in Toronto and went off, in the middle of a downpour, to the Thai Shan restaurant, where we feasted and feasted. I was going to include a variety of photos of the dishes, but that would be a ton photos. I decided to stick with just two. There were five in our group, and we ordered a large selection of appetizers/salads and main courses. The papaya salad was quite tasty, and so were the shrimp and pork satays. One of the most spectacular dishes we ordered was the whole fried fish served with a sweet chili sauce. We also ordered the MeeCorb (I'm used to seeing this as MeeGrob. Are they two different dishes?). This version was a shrimp stir fry using the same heavy sweet chili sauce served on top of deep fried rise noodles. And this is a small selection of the other dishes we ordered: chicken with basil, pork with ginger, and pad thai. It was an enjoyable dinner, though I must say that Thai Food I've had in Ann Arbor is, on the whole, better. Almost all of the dishes were on the sweet side. I don't know if it's an accident of the dishes we chose, or if it's the restaurant style, but it got to be a bit overwhelming after a while. I love basil. I grow a ton of it every summer to use fresh in season. Then I freeze it for the winter. Sure, it's not the same as fresh basil and there are dishes that you can't use frozen basil for (though it does quite well for stir frying), but I can't stand the thought of paying several dollars for a small handful of basil when I can grow heaping mounds of it, more than I can possibly use, for the same cost. So here I am, at the beginning of summer, stretching out the rest of my frozen basil while my new plants grow to a useable size. What do you do when you have some chicken that has to be cooked and some left over string beans? Add basil, of course, for a quick Thai-style stir-fry. 1 Tbs chili paste (or to taste) Lan Chi chili garlic paste works well. Heat oil in a wok. Add garlic and stir for 10 seconds or so. Add chili paste and stir fry for another 20 - 30 seconds. If beans are a bit tough, I like to stir fry them first then add the chicken. Otherwise, stir fry chicken until mostly done, add beans and stir fry for another minute, add fish sauce and sugar to taste. Stir fry until chicken is done. Add basil. Stir and serve. What is it with American grocery stores, at least the stores in my area, that they must sell cilantro without the roots? For one, cilantro with the roots stays fresh SO MUCH LONGER than cilantro that's had its roots chopped off. That should be enough for the consumer to want the roots. But no, I imagine our super hygenic American society finds edible herbs with roots still attached rather gross, so someone (the grocery store? the farmer?) has decided that they must cut the roots off to make cilantro desirable for purchase. I personally think that few herbs are prettier than full bunches of bushy green cilantro with their lacey leaves and long, delicate white roots. Well, beauty is in the eye of the beholder, but I still need those roots. How can I make my favorite Thai "Sweet Pork" dish without cilantro roots? 1) Thinly slice (say 1/4 inch thick) the pork and marinate in the sake for at least ten minutes. 2) Blend into a paste in the food processor: garlic, cilantro roots, peppercorns, sugar, fish sauce, and salt. 3) Heat a wok. Heat oil. Fry the onion in the oil until golden. (I like to make them crispy.) Remove with slotted spoon and set aside. 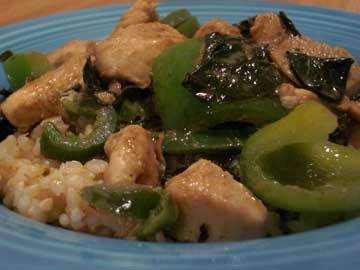 4) Pour in sauce and stir fry for just a few seconds. Add pork and stir fry for 5-7 minutes. 5) Add water, turn heat low, cover and cook for 20 minutes or until the liquid has evaporated and the meat is tender. The end dish should be dry. I find that 1/2 cup of water is too much, and that I have to uncover the pork and boil it off to get a dry sauce. And then I stir-fry it a bit longer (up to 5 minutes or so) on medium-high/high heat until the pork starts to carmelize a bit (browns), but stop before it blackens and tastes scorched. It's perfect with white rice. Yum!